Palestinian political factions, Fatah and Hamas, signed a notable reconciliation accord last Wednesday in Cairo. The agreement may foster a much-needed spirit of unity between the two political camps that have remained divided, with calculated assistance from Western powers, for the last several years. 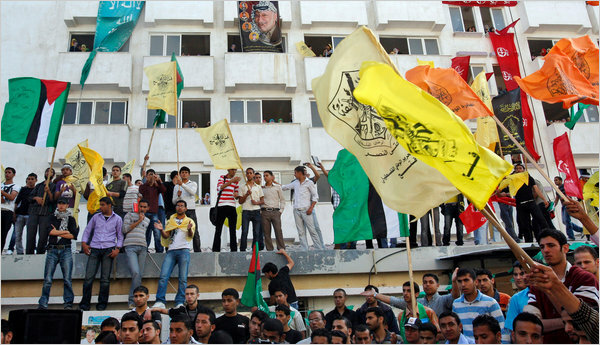 Analysts across the political spectrum have offered explanations for the reconciliation agreement, such as the Palestinian Authority and Hamas attempting to forestall the nascent Palestinian youth movement inspired by the Arab Spring, or the Palestinian Authority reaching out to Hamas to gain a semblance of legitimacy as the great majority of Palestinians see the Palestinian Authority as a Western-backed government that is actively avoiding elections. Angered by the reconciliation agreement and the possibility of Hamas gaining legitimacy, Israel quickly froze more than $86 million of tax revenues collected on behalf of the Palestinian Authority. Rather than holding Israel accountable for seizing money belonging to a foreign government, the European Union agreed to provide additional aid to the Palestinian Authority to help cover the cost of government employee salaries and welfare payments. Hamas does have support among some Palestinians, but they also have to recognize they have responsibilities. To play a role in fulfilling Palestinian aspirations, to unify the Palestinian people, Hamas must put an end to violence, recognize past agreements, recognize Israel’s right to exist. Any mention of Israel’s need to abandon violence was absent from Obama’s speech in Cairo, as it is now absent in the statements that followed the Hamas-Fatah reconciliation agreement. Western powers have been continually harping on Hamas, since their democratic election to power in 2006, to abandon violence and any forms of armed resistance. Even following Wednesday’s agreement with Fatah, Hamas maintains their right to utilize armed resistance, a right that happens to be supported by international law. What has changed is the new agreement that Hamas and Fatah will (theoretically) be in consultation on a variety of governance issues, including chosen forms of resistance. What’s important here is not the agreement itself, personally I hold little hope for change with this reconciliation because Israel continues to hold all the cards – with the necessary support of the West, specifically the United States – while Palestinian political factions continue to play with fake money. Israel is collectively punishing Palestinians, through the withholding of tax revenue, as it attempts to keep the West Bank and the Gaza Strip diplomatically severed. The United States, Israel, and other Western governments issue carbon-copy statements about the need for Hamas to renounce violence; meanwhile, Israel gets a pass as it daily uses violence to suppress nonviolent demonstrations across the West Bank. Violence used to resist illegal occupation, land annexation, demolitions, and the transfer of Israeli citizens into occupied Palestine territory is illegitimate. Yet, violence used for the purpose of maintaining and expanding empire is legitimate, and continually defended. No amount of Palestinian nonviolent resistance will be satisfactorily nonviolent to Israel or the United States. Israel’s use of violence in pushing forward the colonization of Palestinian land and the Palestinian people will be defended. Any act of Palestinian armed resistance will be used as a justification for endless expansion and subjugation, and when armed resistance is absent then unarmed resistance – such as stone-throwing, boycotts, or public gatherings – will be trumped up as a dangerous tactic employed by dangerous Palestinians. It wasn’t hard to predict the West’s demand that all Palestinian political factions renounce violence and recognize Israel while asking nothing of Israel in return, but the imbalanced rhetoric helps to remind us of the hypocrisy of it all. There really are no words to describe the hypocrisy of the United States government when it comes to matters concerning Israel. Only a few days ago, Israeli soldiers shot dead at least 14 palestinian protesters, with who knows how many wounded. Anyone waiting for a resounding condemnation of the killing of people “expressing their legitimate aspirations for freedom and democracy” (roughly the going cliche that Obama has taken to using) might be inclined to believe that these killings took place on another planet. Silence! But woe betide the authorities in Syria! How dare they shoot at protesters! The government should stand down! I said there were no adequate words to describe the hypocrisy here. The rule seems to be: If an Arab ruler (or his forces) kills protesters, he will be condemned by the American president in highly moralistic terms and told to: (a)implement immediate reforms to address the grievance(s), or (b)step aside. There are no words. Literally.